FACT CHECK: Did an Iowa Congressman Retweet a White Supremacist? Rep. Steve King engaged in yet another round of white nationalist speech on his Twitter account. 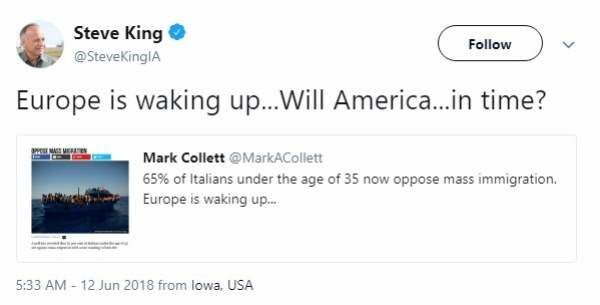 Rep. Steve King (R-Iowa) retweeted a post by a known white supremacist. [Collett is] a neo-Nazi who used to be the youth leader of the thuggish far-right British National Party here in the U.K., which has had ties to Holocaust denial, rampant anti-Semitism, helped spawn one of Europe’s most infamous neo-Nazi gangs, Combat 18, and which once included among its number David Copeland, a bomber who targeted London’s minority communities with a series of nail bombs in 1999, killing three, including a pregnant woman, and wounding scores of others. I see Europe, it’s almost past tense, you can almost say they have committed cultural suicide. And Barack Obama has been feeding us the medication that will bring about cultural suicide in the United States. And we need a president who sees that whole picture and knows that it has to be restored and has an understanding of how to restore the American exceptionalism, constitutional underpinnings and the core of our faith. King continued to peddle the “cultural suicide” anti-immigrant viewpoint throughout 2016 and 2017. The Guardian. 1 May 2002. “‘Dispatches’ – Young, Nazi and Proud.” YouTube, uploaded by 45antifascist. 3 June 2012. Huffington Post. 12 June 2018.